178 Days - Devin's Story - Welcome to A Child's Light! Devin Matthew Logan was born to my daughter, Jessica, at Brigham and Women's Hospital in Boston, MA on Christmas Day 2004. 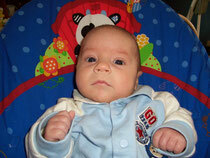 Devin was 9 weeks premature and spent the first 2 weeks of his life at Brigham and Women's Hospital. He was then transferred to the neonatal ICU at Lowell General Hospital for an additional two week stay. He was a tough little guy and I'm sure he was pleased when he was finally released from the hospital and able to come home. Devin came to visit us on Sunday, June 12, 2005. Jessica had to run some errands and we were all happy that Devin was able to spend some time with us. When Jessica picked up Devin later in the afternoon, I reminded her that we had plans to visit my father the following Sunday for a Father's Day lunch on June 19, 2005 at an independent living facility where he lived in Chelmsford, MA. Devin was my father's first great-grandchild. Devin spent the night at the home of his biological father and grandparents who lived in Nashua, New Hampshire. I knew Jessica was going to pick up Devin in the morning, so when the telephone rang at my house late Father's Day morning, I assumed it was Jessica calling to tell me she was running late. It was a telephone call that would forever change the lives of many, many people. I was told that Devin was to be taken by a medflight helicopter from Southern New Hampshire Medical Center in Nashua, New Hampshire to Children's Hospital in Boston, MA. At the time, I was told that Devin was suffering from seizures. I remember driving into Boston thinking - why would you medflight someone to Boston because they are having seizures? The idea that someone may have hurt Devin crossed my mind during the drive to Boston. I quickly dismissed that thought and beat myself up for even considering it. I mean, who could or would ever hurt a baby? Shortly after arriving at Children's Hospital, we were told that Devin had been shaken by someone and that his injuries were so traumatic, he would not survive. On Father's Day morning, Devin was shaken in a fit of rage by a person who could not deal with his crying. Instead of reaching out for help from a family member or putting Devin down in his crib for a few minutes and walking away, the individual violently shook Devin thinking that he would stop crying. Devin was suffering from severe brain and spinal cord injuries. Two days later on June 21, 2005, Devin was taken off life support and pronounced dead after a short, but meaningful, 178 days with us. On June 16, 2006, Devin's biological father was arrested for his death - the charge was second degree murder. On May 24, 2007, he accepted a plea deal so as to avoid a trial and received a 15 year sentence for his crime. On that day, he became known as Inmate# 79057 and a guest of the New Hampshire State Prison System where he will remain until at least July 12, 2022. I do not believe there was intent to harm Devin, but the rage he exhibited is despicable. I do not believe a child who is the victim of Abusive Head Trauma/Shaken Baby Syndrome (AHT/SBS) is intentionally harmed. I believe AHT/SBS is the result of an act of frustration and a lack of education. AHT/SBS is a purely preventable form of child abuse. Rest in peace, little buddy.